Before Renaissance examines a half-century epoch during which planners, public officials, and civic leaders engaged in a dialogue about the meaning of planning and its application for improving life in Pittsburgh. Planning emerged from the concerns of progressive reformers and businessmen over the social and physical problems of the city. 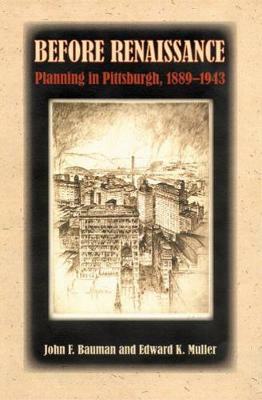 In the Steel City enlightened planners such as Frederick Law Olmsted, Jr., and Frederick Bigger pioneered the practical approach to reordering the chaotic urban-industrial landscape. In the face of obstacles that included the embedded tradition of privatism, rugged topography, inherited built environment, and chronic political fragmentation, they established a tradition of modern planning in Pittsburgh. Over the years a melange of other distinguished local and national figures joined in the planning dialogue, among them the park founder Edward Bigelow, political bosses Christopher Magee and William Flinn, mayors George Guthrie and William Magee, industrialists Andrew Carnegie and Howard Heinz, financier Richard King Mellon, and planning luminaries Charles Mulford Robinson, Frederick Law Olmsted Jr., Harland Bartholomew, Robert Moses, and Pittsburgh's Frederick Bigger. The famed alliance of Richard King Mellon and Mayor David Lawrence, which heralded the Renaissance, owed a great debt to Pittsburgh's prior planning experience. John Bauman and Edward Muller recount the city's long tradition of public/private partnerships as an important factor in the pursuit of orderly and stable urban growth. Before Renaissance provides insights into the major themes, benchmarks, successes, and limitations that marked the formative days of urban planning. It defines Pittsburgh's key role in the vanguard of the national movement and reveals the individuals and processes that impacted the physical shape and form of a city for generations to come. "In Before Renaissance Bauman and Muller secure Pittsburgh's place as a leading edge in the formation of professional planning. By detailing how planners narrowed the progressive reform agenda even as they achieved considerable success in instilling a strong planning ethos, they show how the city's experience set the stage for urban renewal efforts following World War II. Sure to be influential in rethinking the formative history of urban and regional management, their work deserves a wide and attentive audience." "Bauman and Muller deftly weave planning theories and municipal politics, national and local personalities, parks and parking lots, economic transformation and local topographies into an absorbing and wide-ranging history of Pittsburgh's urban modernization. Before Renaissance shows us the varied and often effective urban-planning initiatives of an era often derided for its inattention to urban issues. It is as catholic and as complex as the planners it chronicles."